This week, Dr. Judy Morgan is joined by Dr. John Robb, a respected veterinarian from New Fairfield, CT, known worldwide for his work to Protect the Pets. Throughout his career, Dr. Robb has held an unwavering commitment to pets over profits, starting in 1988 with his first practice where he established Community Appreciation Days, offering free exams and vaccinations to those who could not afford regular veterinary care. He later experienced first-hand the toxic effect of the drive for productivity and profitability over animal care when he purchased a veterinary franchise. It was also where his unwillingness to observe the unspoken “rule” among veterinarians that emphasize protecting the vet over protecting the pet earned him the love and respect of pet owners and the disdain of the growing corporate veterinary establishment. While some in the industry want silence him, he has become a voice and leader for the many animal care professionals who want to live their passion and provide the very best care to our animal companions. 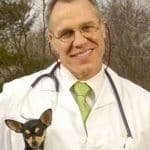 Dr. Robb’s tireless efforts to bring awareness of the dangers of over-vaccination has become a global movement to protect the pets by amending the laws to honor the measuring of circulating antibodies – namely the blood titer – as a true indicator of immunity. This is a show you won’t want to miss as Dr. Morgan and Dr. Robb discuss over-vaccination and how you can protect your pets.